Niantic has announced the star Pokémon of the next community day event in March. Treecko, which is from Generation Three will be the featured Pokémon and spawn more often during the event on March 23, 2019. This time, Niantic is following the typical trend of alternating rare Pokémon with the starters of each generation as Treecko is the first being used for a Community Day Event for the third generation. 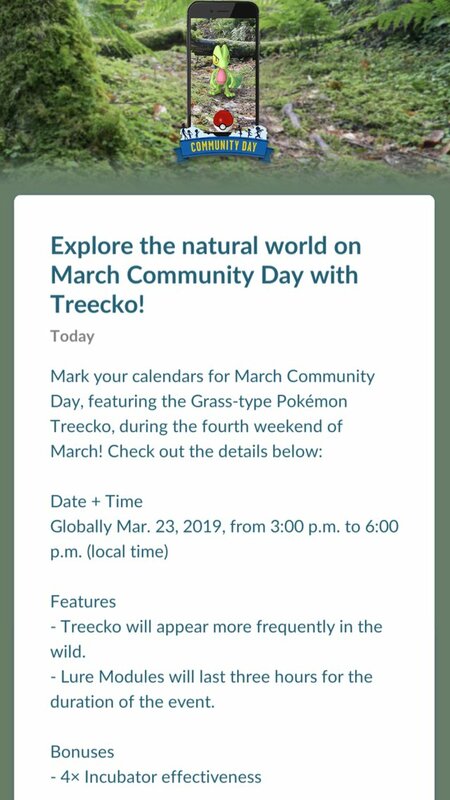 As usual the community day event will last for three hours and will be on a Saturday this time around. The reward during the event will be a 4x improvement from incubators. That means that eggs will only take 25% of the distance to hatch which is a great opportunity for me to hatch the 8 10km eggs I have waiting in my inventory. Surprisingly, no other rewards have been announced except for the typical three hour lure duration. Lastly, you will have a chance to encounter the shiny form of the Pokémon Treecko in increased probabilities during the event. The have yet to announce the special move that will be gained from evolving Treecko during the event but will likely do it as we draw closer to the date of the event. More news to come. Good luck and catch ‘em all! Congratulations @gamercrypto! You received a personal award!